The Zebra was standing on the bank of the Mara River in the Masai Mara in Kenya. It was a day of drama. I felt it at arrival at the river. The air was tensed, the animals skittish, approaching the water very careful, jumping back from the slightest sign of movement. The crocodiles were there. The herd of zebras was split, one part had crossed already and the other part was still on the other side. They were calling each other. The one group that had crossed waited for the others, watching them, calling them. From the other group a brave one approached the river, tested the water, and jumped back. They were waiting, watching, and restless walking around; “talking” to each other, waiting that someone would take the lead. And the sun was burning. This carried on for hours and the air was tensed and the injured zebra was standing with the group that had crossed on the other side. It didn’t move, it was just standing there in the sun. Maybe it healed, maybe not. 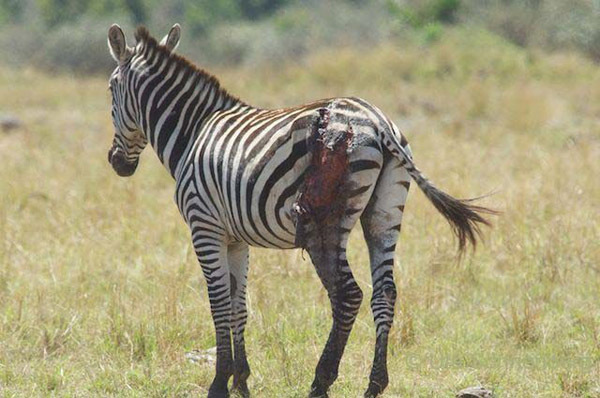 This zebra tells the story of a day of drama at the Mara River. It might challenge perceptions, might evoke emotions and might stimulate thoughts. This entry was posted on Friday, March 30th, 2012 at 11:52 am. It is filed under Animals / Wildlife, Fine Art, Stories and tagged with africa, animals, nature, wildlife. You can follow any responses to this entry through the RSS 2.0 feed.